Durango’s Leland Heinicke scored the game-winning goal Tuesday against Farmington High at DHS. Leland Heinicke has shown a knack for scoring goals in the first week of the boys high school soccer season. The Durango High School junior midfielder directed a header past Farmington goalkeeper James Schryver in the 65th minute of Tuesday’s game at DHS, and it stood up as the winning goal in the Demons’ 3-1 victory. It was Heinicke’s fifth goal in only three games this season, as the Demons improved to 3-0 overall. He had scored twice in the team’s wins against Glenwood Springs and Battle Mountain. Durango trailed the Scorpions (0-2) early in the match. The Demons dominated the opening half, but Farmington found a goal in the 27th minute. After a Erik Quintana shot was saved by Durango goalkeeper Caleb McGrath, the Demons tried to clear the ball but couldn’t. The ball found the foot of Farmington’s Edgar Viveros, who buried a shot from 18 yards out to give the Scorpions a 1-0 lead they would take into halftime. It didn’t take the Demons long to equalize in the second half. Less than five minutes into the half, senior defender Ian Mattox made a run into the box and cleaned up a scrum in front of goal by tapping in his first goal of the season. Durango’s midfield dominated play for much of the match, and several attacks from the wings threatened the Scorpions’ defense throughout the game. After several early chances, Durango’s Lance Townsend finally scored in the 74th minute. He took a perfect pass through the gut of the Farmington defense and buried a shot past Schryver, who was injured on the play, though he stayed in the match. Townsend and company had a chance to add to the lead only a minute later but couldn’t get a shot past the Farmington defense into an undefended goal. It was Schryver who prevented several Durango chances in the first half by coming off his line and beating Demons to through balls and closing shooting windows. DHS has now won three non-league tests and will be challenged in the 4A/5A Southwestern League opener next Tuesday at Grand Junction Central. Telluride 4, Bayfield 0The Miners scored twice in each half Tuesday in Bayfield to take a 4-0 win against the Wolverines soccer team. 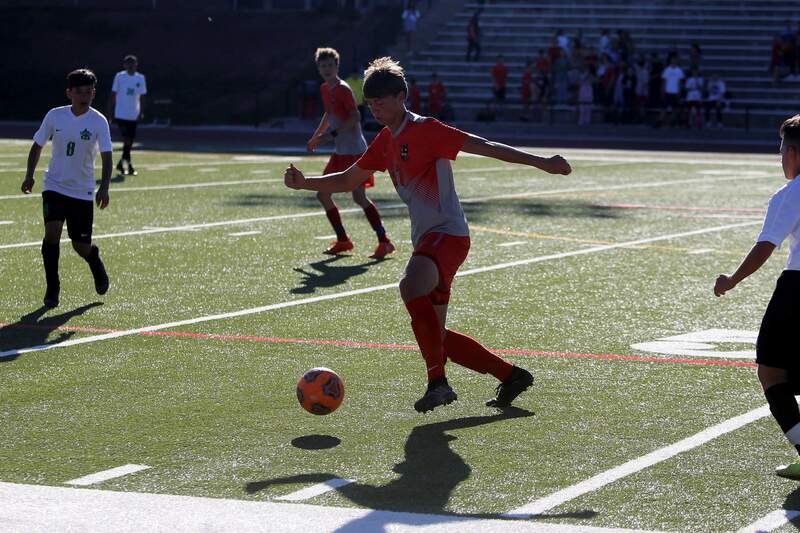 Telluride (2-0) has now scored six goals this season with two wins against Class 3A Intermountain League teams. The Miners won their season opener 2-1 in overtime against Alamosa. Bayfield fell to 0-2 following an 8-0 loss to Crested Butte on Saturday. The Wolverines will host Manitou Springs at 4 p.m. Friday. Boys GolfThe Durango High School boys golf team has proved it can play consistent rounds of golf in 2018. At Monday’s Grand Junction Tiger Invitational played at Bookcliff Country Club, the Demons placed third at 22-over-par. Steamboat Springs won at 12 over, and Fruita Monument was second at 14 over. Steamboat’s Oliver Rotermund won the tournament with an even-par 71. Fruita’s Blake Andersen was second with a 3-over 74. Durango was led by junior Ethan Whidden, who tied for fifth at 6-over 77. Levi Tichi was tied for 12th at 7-over 78, Luke Tichi tied for 15th at 9-over 80, and Sten Joyner was 18th at 10-over 81. Also for Durango, Luke Ford was tied for 19th at 11-over 82. Antony Flint, who led the team in two tournaments last week in Montrose, shot 13-over 84 to tie for 26th. Grand Junction’s Carson Kerr won Tuesday’s tournament at Tiara Rado Golf Course in Grand Junction. He shot even-par 71. Rotermund was second at 1-over 72. Fruita Monument won the tournament at 5 over. Steamboat was second at 17 over, and Durango was third at 25 over. Levi Tichi led Durango. He tied for eighth at 6-over 77. Whidden tied for 10th at 8 over. Flint tied for 16th with an 82, and Luke Tichi tied for 20th with a 12-over 83. Ford finished tied for 27th with a 14-over 85. Joyner finished at 20 over to place 32nd. VolleyballPiedra Vista 3, Bayfield 0Bayfield lost its season and home opener Tuesday night against Farmington’s Piedra Vista High School. The Panthers won 25-20, 25-17, 25-10. The Wolverines will play at 6:30 p.m. Thursday at Monte Vista.